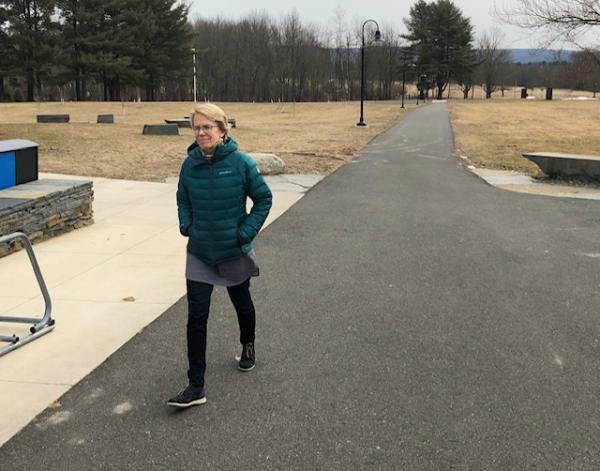 Hampshire College President Miriam Nelson walking on campus. The president of Hampshire College has quit her post amid mounting turmoil over the future of the small private school in Amherst, Massachusetts. College officials announced Friday that Miriam “Mim” Nelson submitted a letter of resignation Wednesday, effective Friday afternoon. She held the position for less than ten months. Facing declining enrollment and financial pressures, Nelson announced this winter that Hampshire was seeking a “strategic partner,” and the college’s board decided not to admit a full class for next year. Both announcements led to protests from students, and anger from many alumni and faculty. Hampshire’s interim president will be Ken Rosenthal, who helped found the school in the 1960s, later serving as a trustee and official college historian. In an interview on campus Friday evening, Rosenthal declined to comment on Nelson’s strategy in recent months. But he did say his long connection to the school gives him an advantage Nelson lacked. Rosenthal said he plans to speak with Nelson next week. Among Rosenthal’s biggest initial challenges is enrollment. He wants the school to return the student body size to between 1,300 and 1,400. But with nearly no incoming class in the fall, and many students expected to transfer, he said he has heard that number could be as low as 650 next school year. To prepare for the smaller student body, Hampshire has already started making cuts. Layoffs of nine staff were previously announced, with more planned for later this month. The Daily Hampshire Gazette reported this week that 34 food service workers at the college, employed by an outside company, will also lose their jobs. Hampshire’s board is also seeing big changes. Board Chair Gaye Hill resigned earlier this week, and Vice Chair Kim Saal stepped down Friday. Trustee Luis Hernandez will serve as interim board chair. On campus shortly after Nelson announced her resignation, faculty member Rachel Conrad was clearly happy with the news. “I think this shows the power of the community of Hampshire College of finding another way forward for itself that retains its mission and can chart a path forward,” said Conrad, a professor at the college for the last 24 years. Conrad said she believed Nelson failed to get to know the campus community. She said Nelson could have used their strengths to help solve the current problems. Goldberg was excited about Rosenthal’s appointment, believing the interim president would help avoid a merger with another school. Student Luke Gannon was not yet sure what to think about Nelson’s resignation. Gannon pointed out that Nelson inherited a tough financial situation when she took over last summer. Gannon, who is from Driggs, Idaho, is studying abroad next fall, but plans to return to Hampshire in the spring. Another student with no plans to transfer is Micah Barnhill-Wright of Durham, North Carolina. He knows the school is going to be smaller, but said that could be a good thing. And if the only way for Hampshire to survive is to merge with a school like UMass, he’s not interested. Sam Hudzik contributed to this report, which includes information from The Associated Press.